The Holy Spirit Rock is an image rock that resembles a woman’s face. Originally, the Lord gave this rock to us as a symbol of the Holy Spirit, but we didn’t know. We just thought of it as the Lady Rock. In 1997, we brought this rock in with 16 other rocks during the peak of the rock landscape construction. We did not intentionally bring this rock in. It just happened to be within the many other rocks that we thought were bigger and better. Before we bought this rock, the previous owner had half of the rock buried in the ground so it kind of looked like a straw-thatched roof house. But even after hearing the owner’s kind offer, there was something about the Holy Spirit Rock that inspired him. So he asked the Lord about it. The Lord inspired him saying, “This is the rock that I want.” So Pastor Jung picked this rock and brought it to Wolmyeongdong. When he first purchased the rock, he did not notice the image of the female’s face at all. Since it was upside down, no one was able to recognize that it had that kind of image. It wasn’t beautiful, and it was kind of small. Half of the rock was buried in the ground. The owner of the company said that he was unable to see any images in the rock even after looking at the rock from this or that angle. After hearing Pastor Jung’s explanation, all the workers chuckled. But when the crane was lifting this rock in the sports field, Pastor Jung glimpsed the image of a woman’s face in the rock. The workers there also said, “Ah, it looks like a woman’s face!” So the workers flipped the rock over and tied it to the crane again. While the rock was being lifted to the spot where Pastor Jung wanted to put it, everyone saw the image of a solemn woman. So the workers placed the rock precisely in a way everyone could see the image. That day, if Pastor Jung had not gone to bring the rocks to Wolmyeongdong, we would not have been able to bring the Lady Rock or the Toad Rock among the 16 rocks the owner let us have. While we worked on the rock landscape in Wolmyeongdong, we brought in many different rocks, but during those times, it was rare for Pastor Jung to personally select the rocks himself. But that day, he went. The Lady Rock was originally worth a few hundred thousand dollars, but we only paid three thousand dollars. When Pastor Jung bought it, he had no idea what kind of image it had. In May of 2012 after he discovered the Holy Son Rock, Pastor Jung realized that this Lady Rock actually represented the Holy Spirit’s face while he was praying. So he decided to name this rock, “The Holy Spirit Rock.” The Lord had given this rock to us, but he did not know clearly about it. 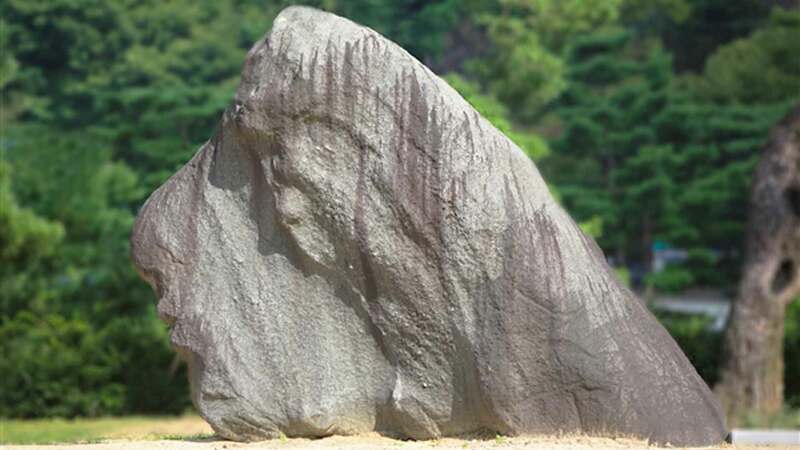 The front part of the Holy Spirit Rock has the face of a woman with long hair. From the back, you can see two faces. So it has a total of three faces! Particularly, on the back of the rock, there is an image of a man’s nose. It is straight and protrudes out like a mountain range. So it looks like the nose of a Divine Being. It made Pastor Jung think of what God’s nose would look like. There are not many natural image rocks in nature. Even when it comes to ornamental rocks, there are a lot of them with images and forms, but there are not many with human images. When a rock contains an image, it is more valuable and meaningful. Like this, the more you resemble the image of the Holy Spirit and her heart, thoughts, and mind, the more your heart will become like that of a divine being and your value will soar to the sky. Then God will consider you beautiful, wondrous, and majestic!